from a variety of industrial processes. Using the principle of “thermal oxidation,” a combustion process, the contaminants within the polluted exhaust gas react with oxygen in a temperature controlled environment. The chemical oxidation reaction destroys the contaminants in the polluted exhaust gas before discharging it back into the atmosphere. What is released is an innocuous emission of CO2, water vapor, and heat. 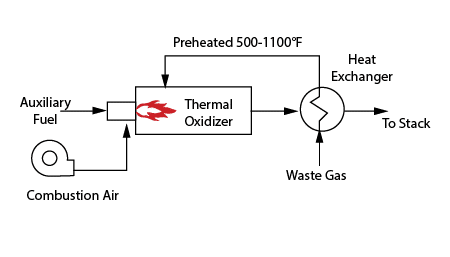 PCC thermal oxidizers operate on the principle mentioned above, which is thermally promoting an oxidation reaction between the pollutant compound in the exhaust gas and the available oxygen. We supply two types of the Thermal Oxidizers: direct fired (afterburner) and recuperative thermal oxidizers. 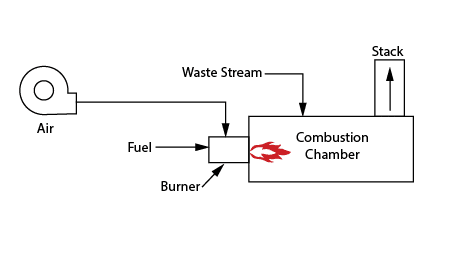 The simplest type of thermal oxidizer, it does not include any type of heat recovery system to recover a portion of the waste heat generated by the combustion process. Typically less expensive than other types of thermal oxidizers, direct fired thermal oxidizers will incur higher operating cost (fuel use) for waste streams that are endothermic. This system is a direct fired thermal oxidizer with heat recovery added at the discharge end of the combustion chamber. stream. A recuperative thermal oxidizer system can have a single heat recovery device or multiple heat recovery devices. Recuperative thermal oxidizers can treat multiple gaseous and liquid waste streams that are endothermic and/or exothermic. Thermal oxidizer applications: custom designed and proven. Our core engineering staff is experienced in process engineering, material selection, refractory design, structural design, and controls and instrumentation. With degrees in various engineering disciplines, our Professional Engineers (P.E.) are also registered in several states. We’ve custom designed more than 1,000 systems for Fortune 500 companies of all sizes– and we have an excellent track record for performance and reliability. Here are some of our typical applications. PCC offers several options for the treatment of off-gases and other wastes associated with the oil and gas. From simple to very complex systems, PCC can provide a suitable solution. PCC has a full range of oxidation/combustion technologies to treat off-gases for most processes associated with the manufacturing of asphalt products. PCC understands you want a complete solution. We specialize in integrating all the pieces of the pollution control system. In addition to the Thermal Oxidizer, we can provide waste heat boiler, baghouse, scrubbers, fans, heat exchangers, etc. and make it into on until functioning efficiently for you.